Jessica is a stay-at-home mom who loves to make unique things for her home and family. She has a love for all things handmade and is always thinking up new ideas. 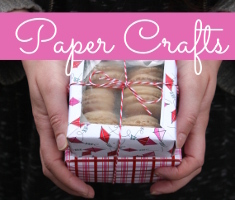 Check out Jessica’s latest creations on her blog, Cutesy Crafts. Hi everyone! I’m so excited to share this Thanksgiving kid craft with you today! When we were making our pony bead pumpkins a couple months ago, there was a point where the beads looked like an ear of corn. 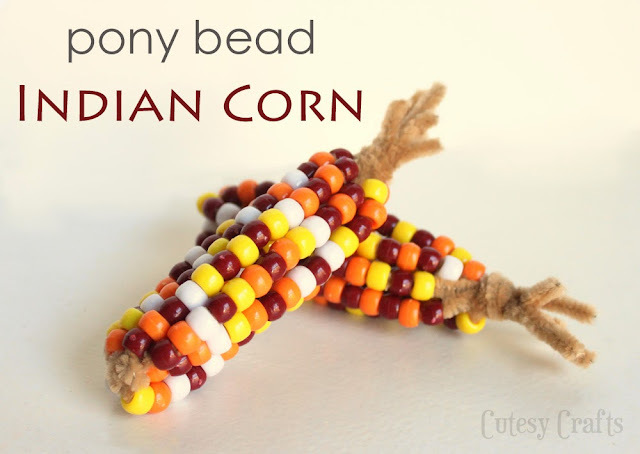 I knew that we would be making some pony bead Indian corn for Thanksgiving. To make an ear of Indian corn, you just need four tan pipe cleaners and pony beads in yellow, orange, white, and maroon. My kids are still pretty young, so I did all of the pipe cleaner parts and they had fun with the beads. Take two of your pipe cleaners and make an “X”. Twist them around each other in the middle. Take two more pipe cleaners and wrap them around the middle the same way. Now let the kids go at it with the beads! Funny, it was so hard for my son to NOT make a pattern. He’s very mathematically minded. Leave a couple inches at the end of each pipe cleaner. Bring all of the ends together. Take one of the pipe ends and wrap it around the others. Wrap another piece of pipe cleaner around the stem if it’s not secure enough, and you are done! They look so cute with the pony bead pumpkins! Be sure to check out Jessica’s blog, Cutesy Crafts for even more kids crafts, home decor, and holiday crafts like her Burlap Pumpkins! 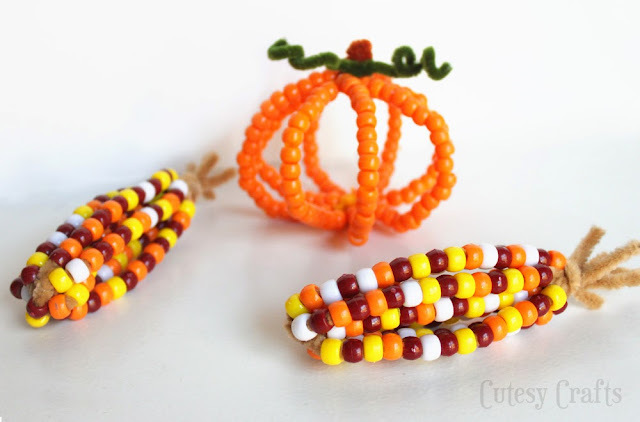 This entry was posted in Beading, Crafts, Fall, Family Crafts, Holidays & Seasons, Kid's Crafts, Thanksgiving, Toddler Crafts and tagged Camp Crafts, Family Crafts, Toddler Crafts on November 27, 2013 by Guest Blogger. Very cute and simple project! I love it! These are so cute. I will be making this craft with my daughters 4 year preschool class for their Thanksgiving feast! Thank you! Great idea! I just took my 6-year old Grand-daughter to school and heard they were having their Thanksgiving Party today at 2:30. As I was leaving my Grand-daughter asked me to come to the party and bring a craft for everyone to make! This is perfect! Not messy, I can use up some old pony beads I had, and I can pre-prep them! Thank you! 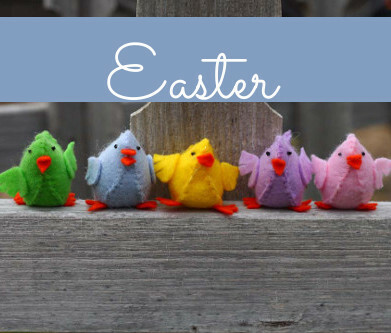 I just love this – it is so simple but looks great – my kids will love doing this. The bead colors you chose are beautiful and festive, and it would fun to try different bead & pipe cleaner color combos. 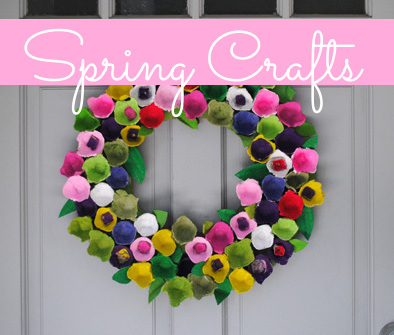 Also a great craft for the family to do together. Thank you for the sharing.